Pull Up The Anchor, …and Haul History Out of The Merky Depths of Time. A few months ago I was at physiotherapy and after dropping me off a fellow motorist pulled over Himself to let him know that the brake lights on our car weren’t working. Luckily we were recommended a friendly garage just a block away from my physiotherapist’s and they were happy to take a look at it at short notice since Himself needed the car for appointments the next day. Since my medical appointment finished earlier than the car’s I decided to do my walking exercises for the day and walk the small street that led to the garage. I’d been in this street before but always in the car and heading in the direction of the physio (rather than away from it) so it was only when I walked here that I noticed that on the wall on the side of the garage there was an old faded sign… and having my camera with me, took a few photographs. I assumed that the top word probably once read “zilversmid” (silversmith) and underneath …(w)erk…en (work… and???) 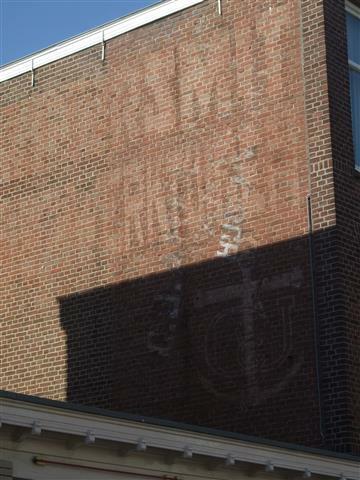 and on the lower wall section there is a drawing of an anchor with the letters “C”and “J” intertwined into it. Our car needed another trip to the garage last week and this time it was quiet and Himself remarked to the garage owner that I had been very interested in the sign on his wall, had taken some photos and wondered if anyone knew any local history about it. The garage owner was delighted to learn of my interest and it turns out he knew quite a bit more about the sign and the man behind it too. According to him I was nowhere near the mark with my wild guesses of “zilversmid”… in fact I was wrong with all of the words I’d attempted to make fit here. 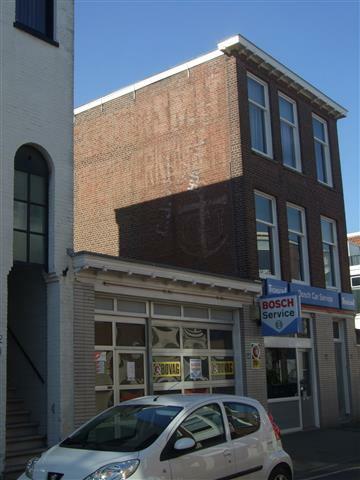 The building apparently was owned by a Mr. Anker Schmit and the address was “Beukstraat 1” (even though the garage is located at “Populierstraat 66”). 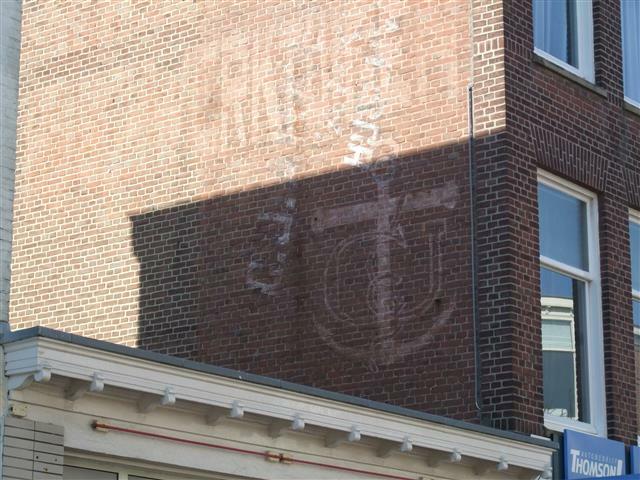 What’s really interesting is that Anker’s work mirrored his name: he made anchors for a living, and sometime around 1900-1930 and the present garage has been in former days the site of his forge. ( I wonder if maybe that possibly meant that Beukstraat 1, a small street close by might have been his shop?) Anker was hit hard by the economic downturn of the Great Depression, but the garage owner didn’t know if the Anchor business survived it or not. Back then, there was a public tennis court in the open space at the very rear of the property but it got very little use several decades later (I think 1950’s) so the Gemeente (City Council) sold the tennis court off to the garage owners father who had at the time recently bought the empty premises at the front, and started his small motor mechanic business there. As the little business grew, more space was needed so his father extended the garage building to encompass the full length of the former tennis court area behind, giving much needed space to the garage, but in doing so sealed the fate of some of the gardens of the houses around it to being some of the smallest in the entire neighbourhood. (Himself and I, by sheer chance looked years ago at buying a house in the street around the corner, and during the guided tour of the house with the agent saw for ourselves just how miniscule the gardens were). 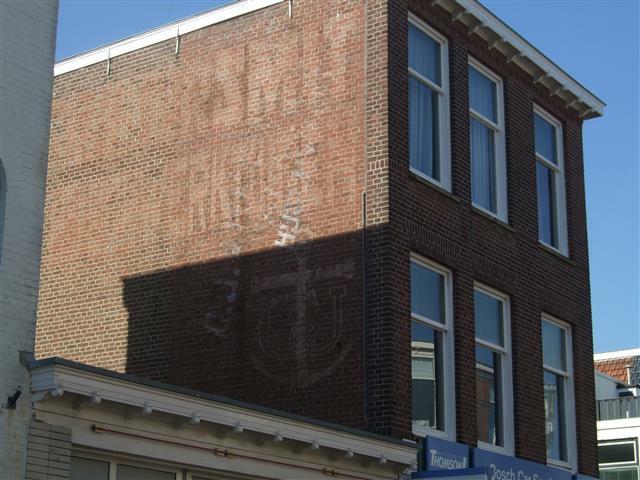 I still not sure how all of the text fits on the wall, but the story of the man called Anker who was an Anchor maker is certainly an interesting find. I love finding out about the history in the city in which I live and find this “hidden history” to be like discovering treasure. Snippets of knowledge peep out from unexpected places and unexpected people like the garage owner’s son, who took over the business from his father. Like pulling up an anchor, it’s like hauling history out of the merky depths of time.